The last of the 5 Odyssey cultures has one thing the others don't have: trousers! We think that massive baggy trousers suit the Persians very well and the posher the fabric all the better to show off your status. 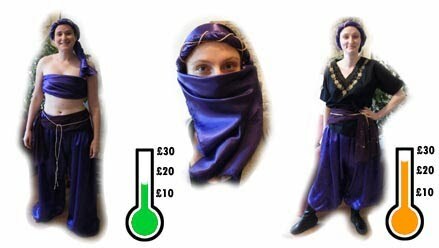 This costume can be made more historically accurate (and a bit less 'Aladdin') by using more natural fabrics and going easy on the shiny satin. But for high status characters you can't go wrong with big purple pants. 3m of elastic. You can buy this in fabric shops but I cut the edge off a charity shop fitted sheet that I'd used for a different costume. If you find a sheet you like the colour of you could use it for your turban etc and save money on fabric. £2? If there's only one piece of costume you make for your Persian outfit, make sure it's a turban. There are lots of authentic ways to tie one, but here is a medieval hat that looks surprisingly good. Cut a rectangle of fabric 150cm (usually about the full width of your fabric) by about 80cm and hem it. The 80cm edge should be long enough to tie behind your head like a headscarf. 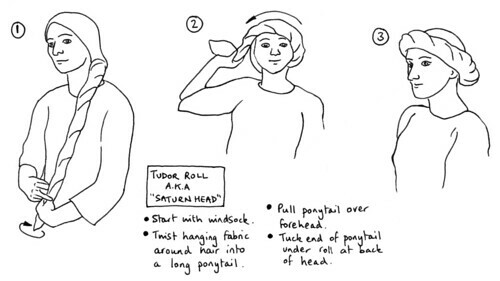 This should give you enough to tie your turban as shown, going all the way round your head once with a tail left over. For a fatter head, use a piece 80cmx300cm or even bigger and keep winding until you reach a satisfactory moon size. For a bit of bling, take a 1.5m length of your cord, and tie it around the top of your wrapped bit. Wind it around as shown. You could use a bit of contrast fabric instead if you like. You should have a bit of fabric left over once you've gone all the way round your head, unless your cranium is abnormally large or misshapen. Drape it across your face as shown - voila! Adopt a bug-eyed stare and away you go. Now for some actual sewing. These trousers are easier (and larger) than you might think. You need two full widths of fabric (one for each leg) measuring the distance from your waist to your ankle, plus four inches for seam allowance. Fold your fabric in half down its length, then fold into quarters to the height shown. Trim off the excess at the red dotted line. You will have a piece that is folded twice and is four layers deep. So you can get your feet out of the bottom, cut along the bottom edge as shown. You now have two identical pieces of fabric that are folded down the long edge. To shape the legs, cut out this shape. If you are a grown adult, you should know where your crotch is by now. Cut the shape lower than you think. This is because a) you will lose at least 2 inches from this as you seam it up and nobody likes a crotch that's too high and b) your bum is bigger than you think. Now separate the pieces, and sew the curved edges together with the fabric right side to right side. You will make two separate legs. Put your legs on inside out like a pair of chaps. Well done. The seams should be running down your inside leg. Grab the crotch seam on each side and align and pin (carefully) as shown. Sew from the centre crotch to the waist front and back. Turn your trousers right side out. You now should have something that looks like these. Aren't they enormous? Yes, your bum really is that big. At the waist and ankles, fold over an inch or so of fabric on the inside and sew a channel around the circumference. Leave a gap about an inch wide so you can get your elastic in. Cut two bits of elastic about this long for the ankles. To thread your elastic through the casings, pin a large safety pin to one end and push it through the channel gathering the fabric as you go. Tie a piece of elastic comfortably around your waist and leave enough to tie it together at the front. Thread this bit through the waist channel. When you get to the vertical seams you might find that the pin gets stuck in the seam. If this happens and you can't wiggle it past you'll have to unpick a few stitches in the channel to get the safety pin through. Try not to unpick too many! Tie the ends together to prevent the elastic coming out of the channel and then tie a slip knot at a comfortable tightness. If you're like us, you'll have quite a bit of fabric left over. This will come in especially handy for ladies in order to preserve your dignity. Men, feel free to wear this costume barechested (if you dare) and/or make the cloak shown below with your spare fabric instead. Ladies, tie the spare fabric around your bust in any way you can make stay on. Here the turban is shown with the tail hanging loose instead of tucked across the face. Adding a sash at the waist not only looks great but covers a multitude of sins, especially if your sewing round the waist channel was not as neat as it might have been. Add the rest of the gold cord as a snazzy bit of decoration round your hips. Here, Jude models the finest that Glasgow's charity shops could provide. The contrast colour breaks up the Milk Tray purple and the gold embroidery ties it all together. You could tuck your vast trouser legs into boots for a rather dashing 'principal boy' look. If you're not going for the rather precarious 'boobtube' look, why not make a cape from your leftover fabric and curtain cord? Hem your leftover fabric. Keeping the cord in one piece, tie each end of it around adjacent, gathered corners (or sew it on for more security). To wear the cloak, the cord should go behind your back, then up under your armpits so that the cloak hangs off your shoulders as shown. Or, pin it to your shirt using brooches as shown in the Rome tutorial. Prance around like you're in a Silk Cut advert. Jude likes this costume so much she's still wearing it. Make this costume look really good by making leather scale armour for under £40. There are lots of ways to save money here by making instead of buying bits of the costume (see other Odyssey tutorials for how to make a T-tunic) but to be honest, you can get nicely embroidered stuff for not much money. We also spent a fair bit on the shiny purple fabric, you can get plain cotton at £1 per metre instead of £3. You have £5 left, which should be enough for some heavy eye make-up. This comes recommended. We sort of made this up, and didn't use any sources. If you find some, do let me know and I'll add to this page.